Is an iPhone Smartwatch Necessary? Rumors have started to surface regarding a partnership between Intel and Apple to launch an iPhone smartwatch. The device would likely connect with your iPhone through Bluetooth and be able to receive emails and check messages. There is certainly support for such as a device as the Kickstarter project Pebble, an iPhone smartwatch, amassed millions of dollars in pledges and funding. There are also other third party watches either already on the market or planning to be released next year that include features such as Siri integration and the ability to receive social media notifications. One of the other supporting factors for an Apple brand iPhone smartwatch is that Apple has discontinued production of the square iPod Nano which has been used by some to make their own watches. The biggest question however is why the idea is so popular. Is it really that much of a hassle to take your phone out to check a message or check the time? Even though it doesn’t save much time; an iPhone smartwatch could save you a few seconds from checking a message or changing songs. It could even be useful in situations where you can’t take your phone out. 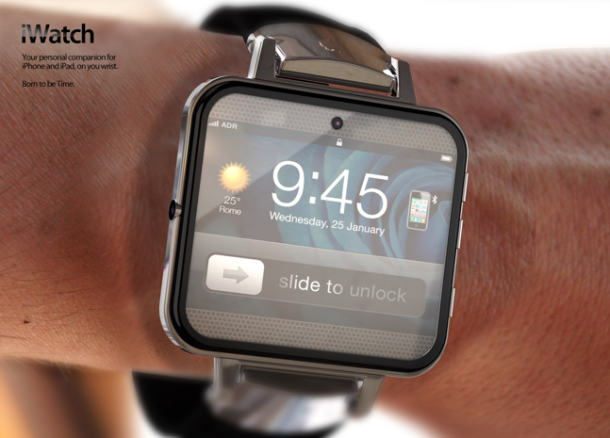 But perhaps a lot of the popularity comes from the ‘coolness’ factor of having a watch that can control your iPhone. And should the partnership be legitimate, the other question is whether Apple will be able to compete with third parties like Pebble that have already jumped into the market. What are your thoughts on an Apple iPhone smartwatch? Would you buy one or do you think the concept altogether is flawed? Let us know in the comments.